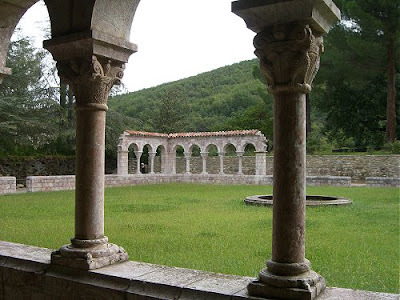 One of them, stone by stone, followed me across the Atlantic a score of years later, and got itself set up within convenient reach of me when I most needed to see what a cloister looked like, and what kind of place a man might live in, to live according to his rational nature and not like a stray dog. St. Michel-de-Cuxa is all fixed up in a special and considerably tidy little museum in an uptown park, in New York, overlooking the Hudson River, in such a way that you don't recall what kind of city you are in. It is called The Cloisters. Synthetic as it is, it still preserves enough of its own reality to be a reproach to everything else around it, except the trees and the Palisades. That is Thomas Merton writing in his early autobiography The Seven Storey Mountain. He was born in the Catalonian town of Prades a short distance from the Abbey of Saint-Michel-de-Cuxa, which is seen in my accompanying photos. During the French Revolution much of the Romanesque abbey, including the cloisters, was destroyed and the materials were used for building local houses. Substantial parts of the cloisters were purchased by the American sculptor George Gray Barnard in the 1930s and shipped to New York to become the centrepiece of the Cloisters Museum, now part of the Metropolitan Museum of Art. 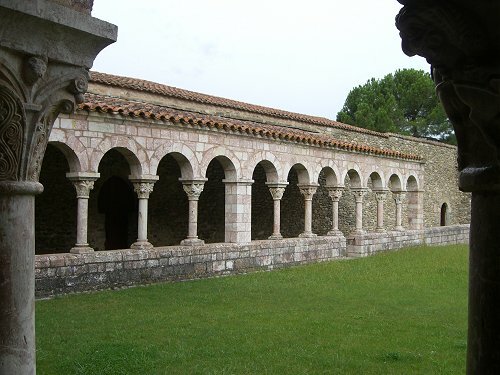 There are important musical connections to the Abbey of Saint-Michel-de-Cuxa. 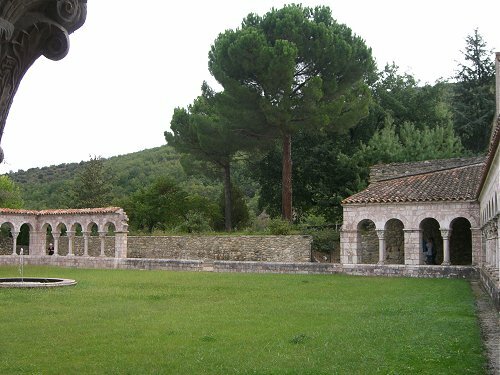 It was abandoned as a ruin until 1950 and Pablo Casals played his first public concert in the then roofless abbey church after leaving Spain as an exile. His Bach Festivals were held there in 1952 and 1953 and the tireless efforts of the Catalan cellist were largely responsible for attracting the funds for the building's restoration. There are are also important musical links to the portion of the Abbey of St. Michel-de-Cuxa that followed Thomas Merton to New York City. 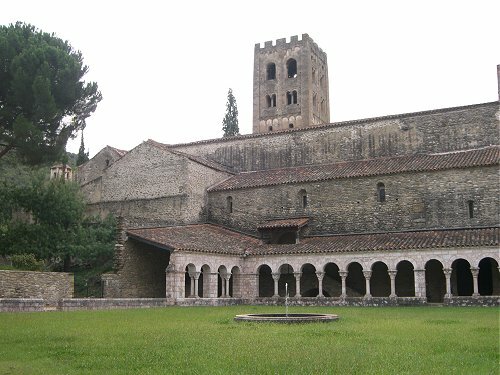 In 1958 the The Play of Daniel was premiered in the Cloisters Museum by the pioneering early music ensemble Pro Musica. This piece of creative scholarship was the brainchild of early music champion and political activist Noah Greenberg. The Play of Daniel had no aspirations to authenticity and featured a Lincoln Kirstein staging complete with prancing lions and fire eater, and the modern edition of the medieval score was linked by an English verse narrative by W.H. Auden delivered by an actor dressed as a monk. But The Play of Daniel was box office and went on to become a best selling record and was performed many times in America and overseas by Pro Musica. The equivalent for these days should be baroque players but I feel that there is a difference in their contribution. Most of the players are very very dogmatic and tend to apply their principles too much beyond baroque composers. Interpretation is subordinated to strict adherence to certain performance principles, no vibrato (glassy string sound …) , fast tempi with lots of rubato, … Baroque contribution should have been a more theatrical feeling to instrumental music or certain different harmonies and inner voices, not what we have. These days, the Berlin Phiharmonic and others are just trying to mimic baroque practices. This just does not make any sense. Do not baroque players have their share of responsibility for classical music's current problems? This typically discursive path takes us from Thomas Merton to the Berlin Philarmonic with the basso continuo supplied by a Romanseque abbey in France. But it is an important path that links to recent debates about amplification and sound shaping, and even about funding, because Pro Musica received a Ford Foundation grant of $465,000 dollars to continue its work. Classical music often reaches its largest audiences when it combines impeccable scholarship with interpretative freedom. Is Antoine Leboyer right in saying that musicians today are too dogmatic? Do we need more of Noah Greenberg's style of creative scholarship? Do we have the balance between authentic and synthetic wrong? Can classical music learn from Thomas Merton's words about the Cloisters Museum? - "Synthetic as it is, it still preserves enough of its own reality to be a reproach to everything else around it." * Harry Haskell's The Early Music Revival (ISBN 0486291626) was used a source on Noah Greenberg's The Play of Daniel. ** Hear Bach without baroque practices in a podcast of my musical homage to Catalonia which includes Pablo Casals' 1950 recording of the Fifth Brandenburg Concerto complete with piano solo and other delicous examples of creative scholarship. Listen here. *** A new recording of The Play of Daniel by the Dufay Collective was released in 2008. "...the Berlin Phiharmonic and others are just trying to mimic baroque practices. This just does not make any sense." Is Antoine Leboyer right in saying that musicians today are too dogmatic? To my ears, he has a point ... but carries it too far and falls into his own trap by being too dogmatic! I don't think it's fair to reduce the so-called "HIP" movement in symphony orcheatras and other non-specialist groups to "mimic(ing) baroque practices." Can this approach be carried too far? Of course ... but so can studiously avoiding any taint of "authentic practices." Case in point - the Berlin Baroque Soloists, and my favourite of their CD's which I've heard: Bach cantatas with Thomas Quasthoff (amazon.com/Bach-Cantatas-Quasthoff-Johann-Sebastian/dp/B0002VDYPA). They're Berlin Philharmonic members, and (as I understand it) they use modern instruments, with the string players sometimes using different bows. They clearly use some "baroque practices," but the disparaging term "mimic" is not a word that would come to my mind. Do we need more of Noah Greenberg's style of creative scholarship? Do we have the balance between authentic and synthetic wrong? Absolutely to both! As I said in a comment to an earlier post, I wish the term "authentic" would vanish. It's been misused and abused almost into meaninglessness. The point should be "suitability." Does the performance present the work in a way that has coherence, meaning, and enjoyment? That's what I care about. If I could find my old LP of the Play of Daniel and listen to it, I would care little whether it was "authentic." I'd care a great deal about whether it presented the work effectively. It seems to be far to easy to end up at one end of a spectrum sniping at those who seem to be too far toward the other end. One more example on the topic of "authenticity" or the lack thereof - I'm listening at the moment to Love in her eyes sits playing from Handel's Acis and Galatea, sung by Peter Pears and conducted by Adrian Boult. Great performances exist over a wide band of the suitability/authenticity spectrum. For my taste, this one is high enough in suitability that opinions about authenticity fade. This was recorded in 1959, which I believe was the same year as the (in)famous and much misunderstood Beecham Messiah ... but that's another story. As you write about Prades, I wonder have you also visited the amazing opera festival in nearby Mosset? Pliable, the mention above of the Berlin Philharmonic reminds me that the Chicago Symphony Orchestra has also taken to performing selections from Telemann’s ‘Tafelmusik’ over the past few years (in 2007 and late 2009). I mentioned this to an excellent sextet of musicians from the Helsinki Baroque orchestra at a reception on Saturday night and it brought amusement to their faces. These musicians also surprised me by mentioning their difficulty in getting the Finnish National Opera to fully support baroque opera, as well as contemporary, modern, and 19th c. opera. They would like to perform a major Handel opera, and perhaps Monteverdi’s 'Poppea', in addition to Handel’s ‘Acis and Galetea’, Monteverdi’s "Combattimento di Tancredi e Clorinda”, and a Haydn opera. Also, I don’t know if you have mentioned elsewhere in your writings the New Clairvaux Abbey, in Vina, California, north of Sacramento (and Chico), California, which is being rebuilt from the stones that American oligarch William Randolph Hearst bought years back, in the first third of the 20th c., from an 800 year old monastery in Ovila, Spain. Unlike the Cloisters, in New York City, the Ovila stones – until a few years ago – were never properly reassembled by Hearst in California and were later reportedly sold by Hearst to the City of San Francisco. The stones were recently featured here in the ‘Nova’ television science program on gothic cathedral building technology.